I have shared my experiences with many people and in different places over the past week and a half. I feel tired and emotionally drained. Each time there will be something that really stirs deep within my soul and sometimes this leads to a show of emotion or tears. Today it was sharing about saying goodbye to the women of Yamen, the other day it was when I told of the sad stories the women told us about the many women dying in their villages and earlier it was when I shared about how grateful I was to God to have Lyn as my travel companion. Talking about these experiences allows the feelings, smells and memories to remain alive in my heart and drives me to keep working towards making a difference for the women in this part of PNG. Call it my calling, my destiny, my purposein life, but I really feel that this is what I have to do. Today as I remembered saying goodbye to the women, I had a deep sense that I can’t turn my back on them. It was not an easy trip to make, it was uncomfortable, hot and sticky, but I can’t not go back now. The doors have been opened, I stepped through once and can never turn back. Turning back would be to wipe all those women from my mind forever and I can’t do that. On the Friday afternoon, after the final teaching session which was all about Obstetric emergencies, we then wrapped up the week’s teaching and said a farewell. We were both emotional, Lyn and I, and we really tried to encourage them to take what they had learned from us and share the knowledge with others to make a difference. The women all sat silently and watched us. The air was thick with sadness. Then a lady named Suzanne stepped forward. She was a beautiful woman that we had spoken to a few times, but was very shy and quiet. She came to the front of the church and she spoke in Pidgin English, thanking us for coming to Yamen and teaching them. We could understand quite a bit of what she said but not all. She spoke with passion and her thanks were from her heart. It was very emotional. We then prayed for the women and asked God to be with them and help them as they returned to their villages to begin the task of taking small steps towards change and better outcomes for the women and babies. Again the room was thick with emotion and sadness. It was almost like a funeral. Slowly some of the women moved out of the building, others lingered and chatted quietly, some were still writing down some of the information from the earlier session and others came up to us to shake our hands and say a personal goodbye. Suzanne came to me and said ‘that group of women sitting there are saying that they just want to cry because you are leaving tomorrow’. Oh how I just felt for them. My eyes filled with tears again. I felt like I was abandoning them. But I also knew that they were strong women, they were intelligent and that they could make a difference with the information and hands on teaching we had given them. Near the entrance to the church an older woman Margaret clasped my hands in both of hers. She looked at me intently without saying a word, but with tears brimming in her eyes. I felt she was looking straight into my soul and at that moment I felt likea spiritual connection with her. I then reached over to give her a hug and she clung to me firmly for a long time. I can’t remember if I’ve mentioned this before, but on the Monday Margaret was introduced to us by the other women as their prayer warrior. Whenever a woman was in labour in the village, Margaret would pray for a safe birth (I can’t remember which village she was from). They said that they had seen many miracles happen because of her prayers. I’m sure that she had cried out to God many times for help and I am sure that He heard her and that is why we were there. God does care. He does Love us and He does hear our prayers. Today, as I sat in church with Lyn and sang songs of praise, before our short presentation to the congregation about our trip, I remembered how we sat together in the village church and sang. I have cried a lot this morning as I remember the people in the village and their plight. “God has the whole world in His hands. Remember the old gospel song? He’s got the wind, the rain, the tiny little baby, yes, even you and me in His hands. How easy it is to forget that! And it isn’t limited to our geography or our culture, you know. He’s got the Middle East in His hands (that’s a relief, isn’t it? ), not to mention Central America and China, Ethiopia and India, Indonesia and Russia—all right there in the palms of His sovereign hands. And while we’re at it, He’s got our future, our children, our circumstances, our friends, and our foes in His hands . . . within His grasp . . . under His control. Even when imaginary fears slip in like the morning frost to blight our faith, He’s there—in charge. . . . Thank you Lord that you are in control. As I prepare for and then present I feel that in my mind some things are starting to sit more comfortably and be clearer. I’m seeing where God is already at work and moving and so I’m keen to just follow His lead. This is after my initial time of euphoric thinking and ‘mountain top’ experience visions of grandeur, despite feeling awfully weak and weary from the dose of food poisoning I might add! 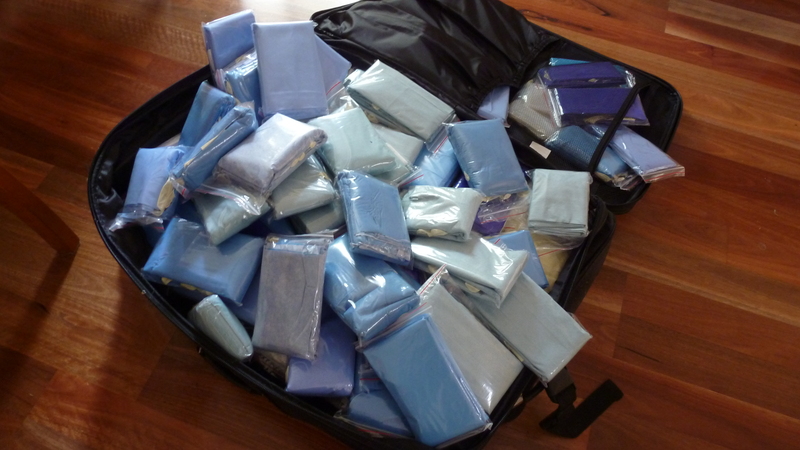 Making up Birthing kits yesterday just took me back to my thoughts and feelings as we made some kits up and then packed them into every nook and cranny of luggage space to carry all the way to Yamen. I want to just stop here for a minute and fully absorb the incredible way in which I just happened to come across the kits and how God provided money and people to make them! The first Monday morning in Yamen with the women, as I listened to their stories and what they told us about their experience of birth, I just knew that the Birthing Kits were going to be a great blessing to these people. How appropriate! How incredibly simple and yet how significant and timely. This was no accident and it certainly wasn’t fate. It was the leading and provision of a wonderful and caring Heavenly Father. 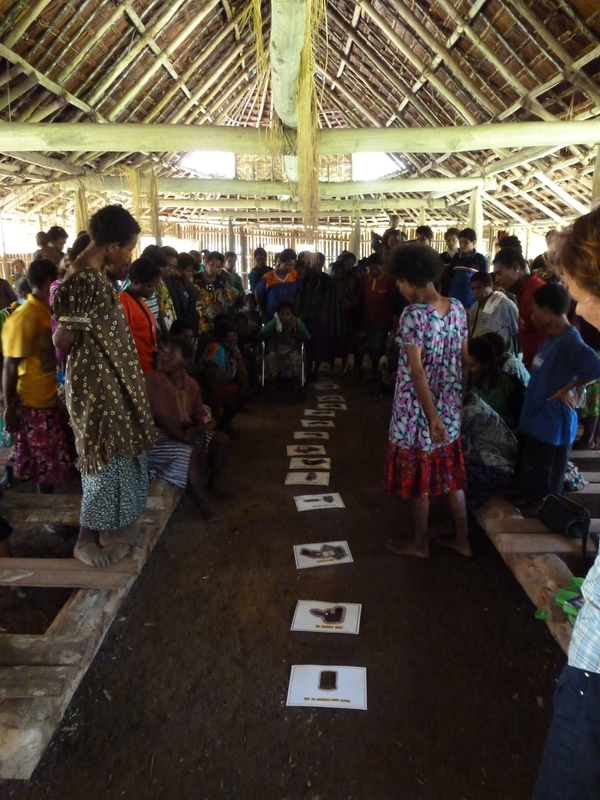 Tuesday afternoon was the time when I gave education about the kits to the women. In the morning they had learned about spacing babies, preventing the spread of AIDS and how to use condoms safely. 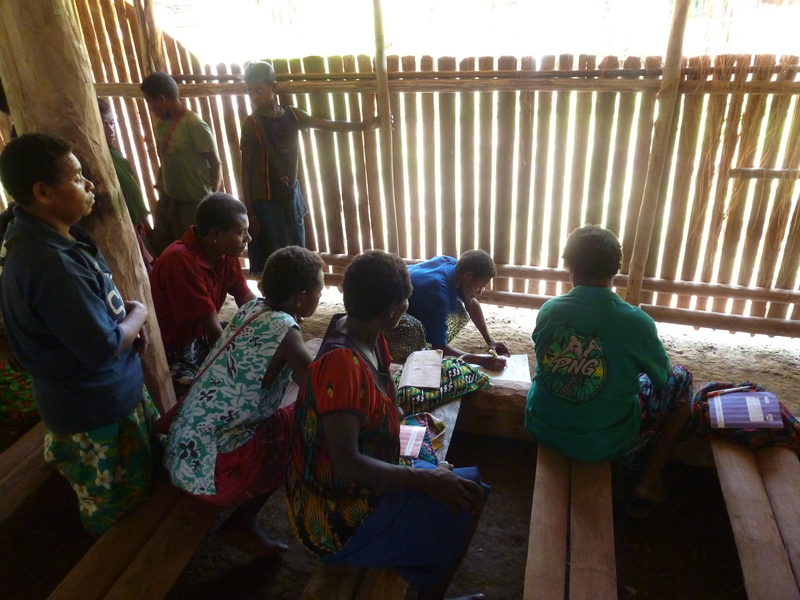 The morning session was for all the women, the afternoon sessions were for the ‘helt luk outim’, health carers, a name we had all decided to use to include all the different people represented such as Village Birth Attendants, volunteers, merisen men/meri and the health worker. It was easier to use just one term when addressing them all. They liked it and I think it gave them all an equal standing with each other, whereas before there seemed to be a bit of jostling for acceptance as the most important. So, the session began with a short talk about antenatal care: the how and why antennal education and support was important. I divided the group into 4 and they each had a piece of butchers paper and a texter. 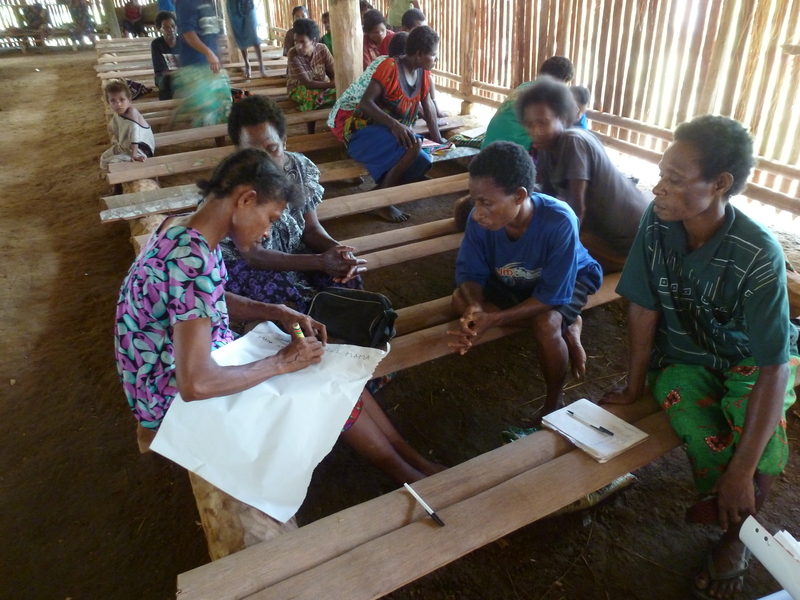 I asked them to write down how they could start doing some education in their village and what topics they would cover. Then I got each group representative to stand up and give a summary of their main points. It was incredible because they really did a great job AND they listened to my instructions – I had said that if another group had already made a point, not to repeat it but just share new thoughts they had. It would have taken too long otherwise! They came up with ideas for teaching no smoking during pregnancy, good diet, exercise and rest, as well as visiting the clinic or VBA for check ups. This then led for me to explain the birthing kits: what they were, how to use them and how to use them as part of engaging with pregnant women earlier in their pregnancies and thus starting the beginning of some antenatal care and support, building relationship with the women before birth. Inside the kits are: a sheet of plastic, a pair of gloves, a piece of soap, some gauze, 3 pieces of string and a sterile scalpel blade. I told them who had made the kits – ‘women who really care for you and want to try and make a difference’. I said the kits were made with love from the women in Perth. There was a gentle sigh that went around the room – they were genuinely touched by the fact that other mothers in another faraway country had made the kits especially for them. Lyn then wrote on the board in chalk the ‘7 cleans’ for a safe birth, something I had learned from the Birthing Kits Foundation. Just an aside, before I even started making the kits, I contacted the Birthing Kits Foundation which is based in South Australia, to tell them of my trip and my desire to take kits. They were great and sent some over as samples to see if there were any other groups in the area that could be partnership organisations for distribution and monitoring of the kits. They are apparently inundated with requests for the kits and so have had to be strict about who they work with to ensure that they get to where they are meant to go, that the people are properly educated about their use and also the safe disposal of the items after the birth. They also want to collect data to measure whether the kits are making a difference. So, they were unable to supply me with kits, but were supportive. I went through each item and demonstrated on the models (Lyn included as the woman giving birth!) what each item was used for and then how to safely dispose of the things, in particular the scalpel blade. After talking with them, it seemed the safest way to dispose of the blades was to drop them to the bottom of the long drop toilet! After the education session I then asked them to send one representative from each village to come with me and I’d give them a supply of birthing kits to take back to their village. I was expecting 5 representatives. When I got back to our haus and then looked down to see who was there, a whole crowd had appeared. I reminded them that I just wanted one person from each village. One lady spoke up and said yes, there was just one from each village, but there were many villages. This is when I realised how many villages had sent people for education! I then asked them to give me their name and the village they were from. It totalled 19! We then made a decision to sort out the kits and hand them out later on in the week. This morning I gave 2 presentations to groups of children at my kids’ primary school. I spoke to Year 6s and the Yr4/5 class. It was an amazing experience and I thoroughly enjoyed it. Exhausting! This week is Anti-Poverty Week and so I shared about life in the village of Yamen. They were fascinated by how different it was to our lives in Perth and I hope they realised how fortunate they are. I think they did. 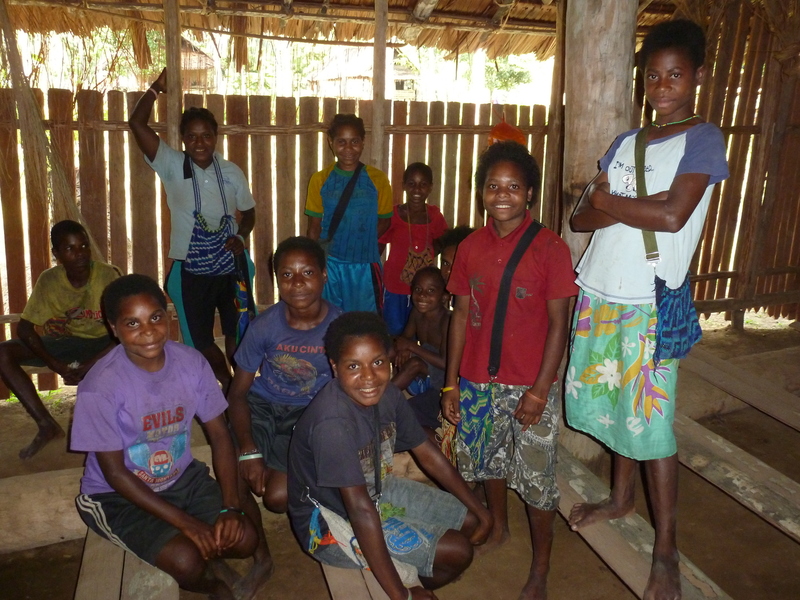 They even recognised the importance of education and how the children in the village, by not having an education, were missing out on many things and opportunities. The kids made up some Birthing Kits and included a little note with a drawing or motive on it to make it more personal. They seemed to really enjoy doing that. I have also asked them to design and draw a health campaign poster highlighting a specific health message such as preventing malaria, washing hands after the toilet and before preparing and eating food. This will be a project they continue to work on in class and I will choose the best ones (ie those that tell the message the clearest) and then take them to the village on my next trip. One of the teachers is organising for the class to fast during one of the school days and then donate the money that their food would have cost, towards postage for the birthing kits. Isn’t that great! I’m so excited about these kids being involved in this project. It will make a difference for the health of the mothers and babies in the villages, but also make a difference for them too as they realise how blessed they are. Last night I gave a similar talk to a group of cub scouts. The theme was adventure and I described my trip as an adventure. I specifically wanted to share about moving out of your comfort zone and the kids really identified with this concept. They didn’t giggle when I told them how I cried when I realised where I was for the first night, they really listened and I could sense they knew what I meant. I hope I’ve inspired these boys to move into a ‘discomfort zone’ and learn more about themselves in the process. After John and Gina, came Philip and Maria. Philip is the Merisen Man from Yamen and Maria, his wife, the Village Birth Attendant. Our first meeting with Philip had been quite awkward. It was earlier that day at the first session which we had tentatively called ‘womens business’, a time to hear from the women what they felt the problems were in relation to deaths in pregnancy and childbirth. Village life is very paternalistic and we were aware that this opportunity was rare for the women to have a voice with ‘people in power’. We had already asked Matteu, the Health worker to come back in the afternoon and he very graciously went to Mike’s session on leadership instead. He seemed to understand and get the idea that it was women only for the morning. But Philip, well he wasn’t going to budge. He sat at the back of the church with a folder of information and a look of distrust and offense. ‘Oh no’, I thought at the time. ‘This guy is unhappy and probably been offended by our intrusion onto his turf’. I remember saying to Lyn that we were going to have to just go on as if he was not there, and then really butter him up to get him on side. Lyn was awesome! She did such a great job talking to Philip, listening to him, sharing ideas with him and including him in everything we did from then on. I have to say that if it wasn’t for Lyn, our experience may have been very different because to be perfectly honest I didn’t have the time or patience to deal with this guy and his ego. I really felt I had a job to do with the women and couldn’t be bothered stroking ego’s while there were lives to be saved and traumatised women to be supported and equipped. I don’t mean to be rude and flippant because I’m very good at stroking egos when it is needed to achieve trust and respect and get a job done, but in this case I felt very single-minded about doing what I came to do: teach the women. It was another example of the fact that God knew what was needed and He provided for every need, even supplying Lyn to attend to the Merisen Man, opening the way for me to have unobstructed access to the women. It was great having Mike with us for this conversation – such a wise, gentle guy. A man of few words, but each word carries such depth and insight that it moves through space with its own momentum and carries meaning that transcends the actual conversation. Little is actually spoken and yet a whole lot is said. Lyn and Mike initiated the conversation, asking about them and their family, then about their roles and responsibilities in the community. We were starting to get a clearer picture about all the different health roles: Merisen Men and Meri (Medicine Men and Women) are volunteers who run the first Aid posts, they too have had a little bit of training. They dispense medicine, provide first aid and can refer people to other health services or the hospital. Volunteers are people who help and have had no training. A Health Worker is a paid person who has had more training, they are not a nurse or a paramedic. I’d put them on a par with a volunteer ambulance officer here in Perth, but the Health Workers are paid by the government. They service a huge area and are based in their village with a health centre. It was hard to understand the difference between a health centre and first aid post, but it appeared that each village had a first aid post which was run by a MM, some had a health centre that had a bit more equipment and was run by trained paid Health Worker, but we’d also heard from the women that many of the health centres were closed because of no trained person to run it. Village Birth Attendants are volunteers who assist with births, some of whom have had training, but mostly untrained. Maria told us there was no antenatal care, the VBAs didn’t form a relationship with the mother before the baby was born; they were actually only ever called when there was difficulty in labour and the mother was nearly dead anyway: what an awful job. Really they were female undertakers. No wonder she didn’t have a smile on her face! We started to talk about a few more issues that they as the health carers in the village felt needed addressing. And so as we talked, the ideas that Lyn and I had about the teaching sessions became even clearer. Together with Philip and Maria we formulated a plan: a class outline for each day. We discussed running a clinic, but mainly to teach the MMs, VBAs and volunteers. Lyn liaised with Philip when the best time for that would be and the logistics of where to hold the clinic. She arranged with him to meet the next day and see his first aid centre. He seemed to be more relaxed and was happy to be included and regarded as an important link with the community. 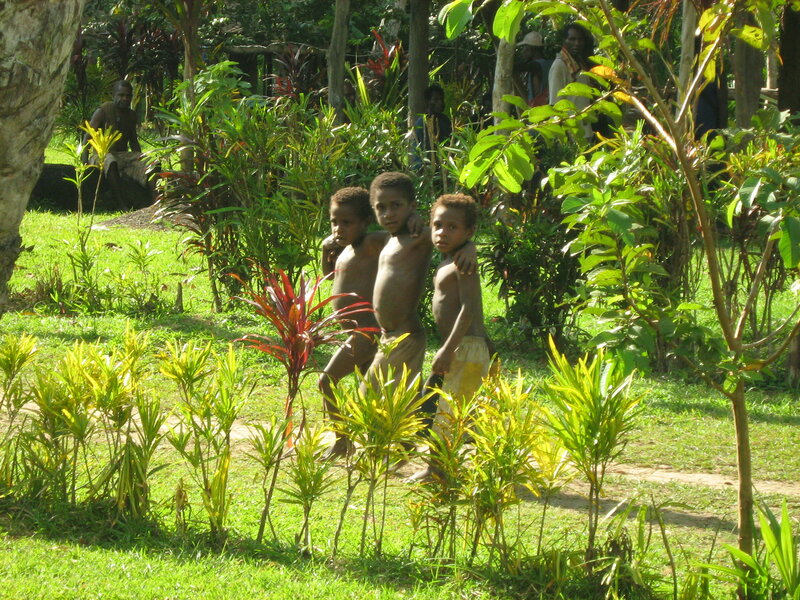 So, Tuesday morning we awoke to the sounds of a drum beat alerting the villagers to get up and prepare for the day. Devotion at 8am, teaching starting at 9.30am. For breakfast we generally just had a few wheatbix, warm powdered milk and chopped banana on top. It was delicious and probably a good food to begin the day with to sustain us through a busy morning. On a personal note, the thing I had dreaded the most had started the previous day. My monthlies! But thankfully it wasn’t as bad as I had imagined. 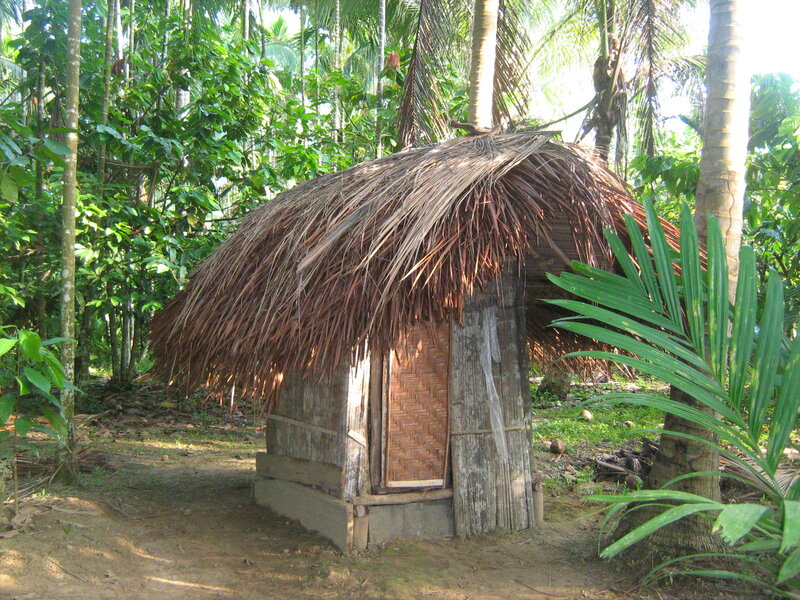 We had our own longdrop toilet (liklik haus), complete with spiders and raised box to sit on (quite comfortable really as long as the previous person had aimed straight!). Thank goodness for sanitizing gel! I don’t know how we would have survived without the stuff because it was a tricky walk to the river as it was quite low. We had to walk down a steep sided bank to get to the water. We had our own supply of rainwater which we had brought from Wewak, but its difficult pouring water over your hands to wash them. Good old sanitizer worked well. Lyn and I had a small bottle in our pocket for all occasions and then we had the mega bottle for stocking up and when we ran the clinic. So, toileting was a little more complicated than usual, but not as bad as I’d expected. Fortunately my monthlies were not as bad as they usually are and thankfully I didn’t experience the pain and dragging feeling that women often have at this time either. Thank you Lord! Our first session for the morning was Family Planning. Many women had asked me how to ‘space’ the babies. 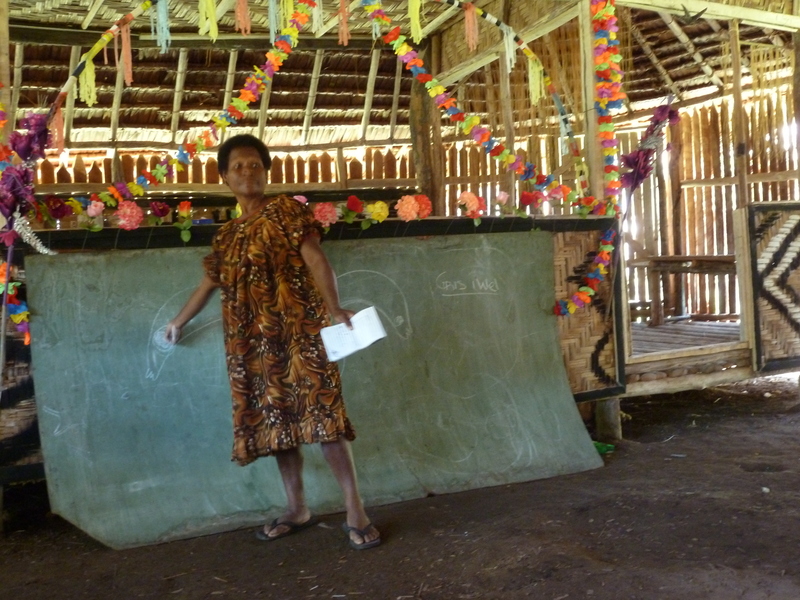 I was a little rusty on the topic and so asked Brigit, the woman from the Catholic village of Kambot, to teach. I identified Brigit on the Monday as she spoke very good English and had obviously been well trained. 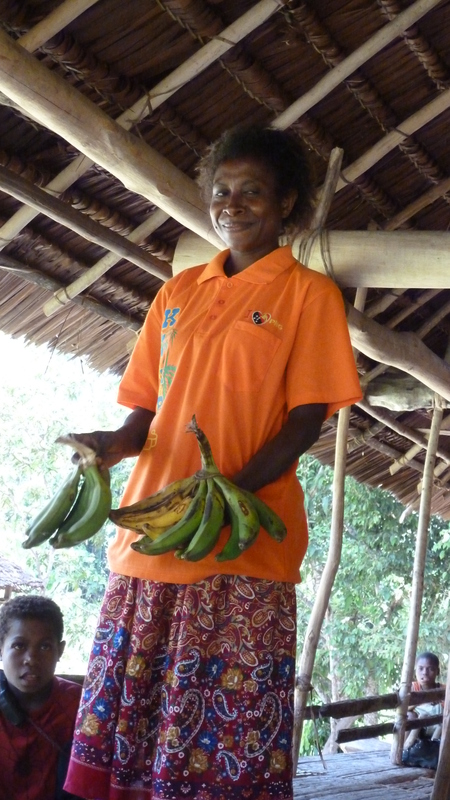 She has been teaching Natural Family Planning in her village for 20 years and had recently had some teaching from the Australian AIDS council on AIDS prevention. She said that in her village the women only have 3-4 children, whereas in Yamen and many of the other villages the women were having 10 – 15 babies each! The sticky point about the presentation for me was the Catholic teaching. Condoms were ok to stop the spread of AIDS, but they were a definite no, no to prevent pregnancy. I found this intriguing. There were a few moments when I gulped hard and wondered whether I should intervene, but then when I balanced what she said which was controversial against the practical factual information which was good, I sat back down again and waited my turn. When she said that the minute the sperm fertilises the egg (while pointing to a chalk drawing of the fallopian tubes) the Spirit of God enters and so if that is deliberately prevented from growing into a person, then it is an unforgiveable sin. Firstly, ‘unforgiveable sin’ is not a biblical teaching. There is no grading of sins in the bible. That is a manmade concept to make some things people do appear worse than others, therefore they need more forgiving. Jesus died once for the sins of all. All sins. That’s what I find so beautiful about Jesus, and it is so simple. He died for all. No matter what you have done in your life it is forgiven. And he goes on to say, ‘sin no more’. So receive the forgiveness for something and then don’t do it again. I had to let that one slip, to allow the relationship to remain good and respectful so that all the other teaching would be well received. I didn’t want to undermine her in front of the other women. Once Brigit had finished and we’d answered all questions stemming from her presentation, Lyn spoke about AIDS and the use of condoms. What a great way to finish the morning. 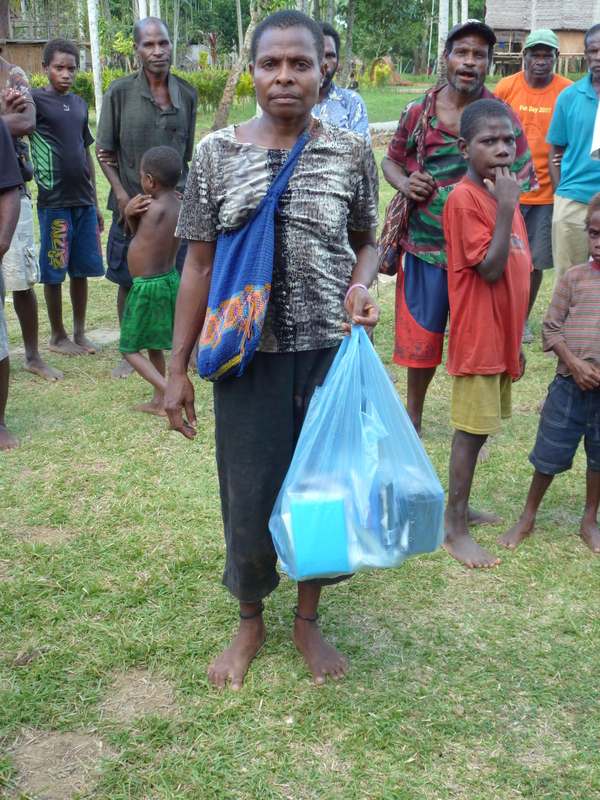 AIDS is a real problem in PNG, but particularly in the main towns ans cities. In the villages it’s not such a problem, but if the men are travelling to the towns to sell goods, the potential for them to have a ‘rod bel’ (make a pregnancy along the road!) was high and thus the risk of passing HIV to their wives back in the village also very real. I did see a couple of women who had the HIV AIDS look about them, but otherwise we had no idea how many women were infected with the virus – principally because there is not the antenatal screening like there is in Australia because there is NO antenatal care. Anyway, Lyn did a fantastic job giving an overview of HIV, how it is transmitted, how it is NOT transmitted as there are many rumours circulating that are based on fear and misinformation. She then went on to give a demonstration about the safe use of condoms using a lovely big banana. Due to the heat and humidity, the banana ripened rather quickly and by the end of the visual demonstration of how to safely put on a condom, the end of the banana was drooping and coming apart!! Lyn and I just laughed and laughed. She then finished the session with an interactive condom game which she got from Family Planning Association WA. There were a series of pictures with drawings aimed at Aboriginal people. Lyn put the pictures down on the ground in jumbled order and then the women had to place them in order. There was much discussion which was wonderful to see and they really took the activity seriously. After about 10 minutes the task was finished and then Lyn ran through the proper order. They had done well. It was now time for lunch and a well earned rest. After such a lovely time floating for a few days on the Indian Ocean, resting and reading, I’m now allowing myself the indulgence of writing. A friend of mine who is a writer has told me that every day she thinks about what to write about, plotting storylines, picturing scenes and describing characters in her head. I found that quite a foreign concept until now. My thoughts now become ideas for blogging!! Does this mean I’m becoming a writer? Time. The concept of time is a baffling one. As a child time took so long. I remember quite distinctly my Mum dropping me off to have a play with a friend at the age of about 6. She said I had an hour. I remember feeling as if I had all the time in the world. A whole hour. Growing up I felt like adulthood would never come. It seemed to take a lifetime to get to 18. And now, well they warn you that the years go by quicker as you get older. Ryan will be 12 at the end of the month and soon Matthew will be 10. Instead of Richard looking towards his 40s, it’s now the 50’s. Thankfully I’m still well and truly on the side closer to 40! But, in the village I felt that time stood still. Most people didn’t know their age. To ask after someone’s age you said, ‘How many Christmases?’ Many just shook their heads and said they didn’t know. 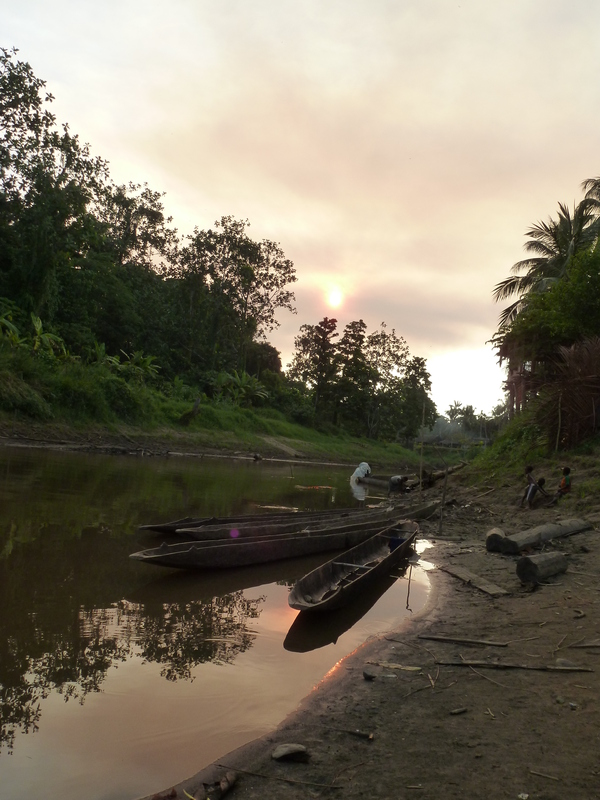 Life in the village followed the life of the river and the wet or dry season. Since returning to Perth I have been very aware of the pace of life here. In particular because I have felt the pressure from Vivien to post her books. I haven’t done that yet! It’s not because I’m slack, it’s just because I haven’t had a chance. Yes, I could be doing it today instead of indulging in some writing, but I’m not in the mood and I want to write a nice letter to her as well. It’s only been 4 1/2 weeks since I was there. It seems like just yesterday and yet for her, it’s probably been forever. I was thinking about this the other day. I remember that when I said to Gina, who had prepared all our evening meals and generally looked after us in Yamen, what will she be doing once we left, she said, ‘nothing’. That was when Mike gently suggested to her that we all felt she would make a lovely teacher and perhaps she could start up the school againJ. 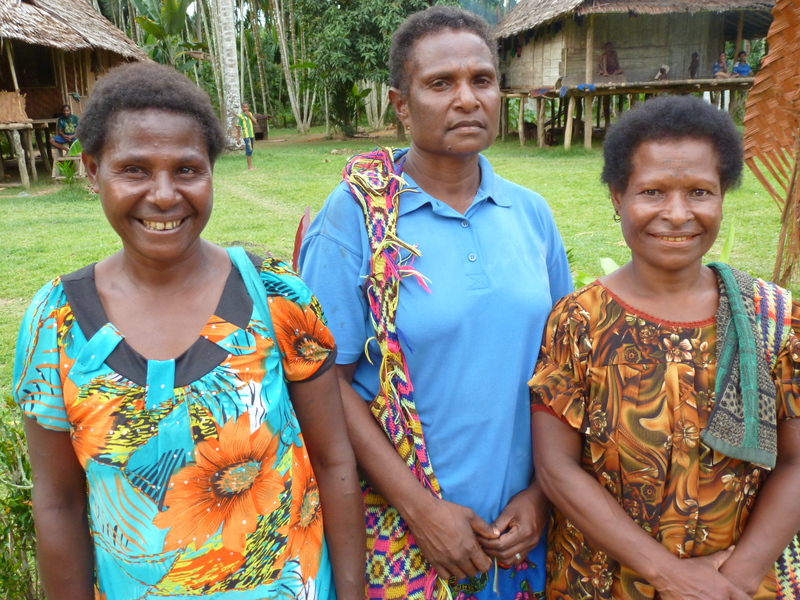 Yabru said to us that they (church and village leaders) are very concerned that there will be a whole generation of village Papua New Guineans who are illiterate. When the missionaries were there in the 50’s, 60’s and 70’s there were schools in the villages and literacy rates went up. Pidgin and English were taught. Yabru is a result of that education. As were many of the people aged about 35 and above. He then scanned his arm around the village and said, ‘they have it too good here to do anything about it’. It is pretty good. Plenty of food and the life-giving river. BUT again, it looks idyllic on the outside, but if you are sick or you are a childbearing woman, the reality can be quite devastating. Vivien has probably not got a lot to do. 4 weeks for her feels like an eternity whereas I feel I was only there the other day. I’ve had to recover from food poisoning, attend to school activities (choir event, sports carnival, music lessons, homework, basketball training), support my husband who is dealing with a lot of work stress, pay the bills, sort through insurances, keep in touch with people not just in my neighbourhood but right around the world! Phew, it’s a lot to do. And I still don’t do as much as some people I know. Vivien is going to have to be patient and wait. I will follow through with what I said I would do and I have reassured her of this. In the meantime she will need to do what she can with the information and resources I left with her. When I post the books to Vivien I also want to write a note for her and give her some more pointers about starting some antenatal care in her village. That takes careful thought and time. I have done some more research and also received some useful documents from a colleague working for the World Health Organisation in PNG. As I’ve been reading through the material, comparing it with my experiences in Yamen, a picture is forming in my head about what I can do to provide practical help and support to Vivien and the other Village Birth Attendants. Keep it simple stupid, but sometimes simple takes time. Village life as I’ve mentioned before is slow. It is very hot and humid so when the temperature is really hot, many people just lie around at home in the shade, on their verandahs watching the kids play. Many times I noticed the mothers with young babies at the house next to us, lying on the floor of the house playing with their babies, holding them up above them and making them giggle and squeal with delight. Families live close together so staying in touch doesn’t take much effort. Getting food for dinner is a short walk to the plantation. The men have a lot to do to get meat or catch fish, and skinning a chicken is not the simplest thing to do, but if that’s all you have to do for the day, you can focus and give it all your attention and everyone knows that that is what you are doing for the day! I think time does go faster in our part of the world. We have so many things to do and so many options of things to do. Doing nothing to us is reading a book, probably playing with the children or preparing a meal, perhaps even doing the gardening! I would suggest that our doing nothing is actually doing something! It’s just that those simple, repetitive, more mundane tasks of life have lost their importance in our world and so they are regarded as nothing. Comparing life here in Perth and that in Yamen neither are perfect. I’d say that somewhere in the middle would be good. We need to slow down and not do so many different things (stretching ourselves between too many tasks is not good) and they need to step up and start doing things that will make a difference: to them as individuals (by improving self esteem) and to the community as a whole. Just little things like start some simple language and maths classes for the children, begin teaching some informal lessons to the women about having a healthy pregnancy and spacing babies. Keep it simple stupid. But simple can take time. It’s school holidays. My husband is also on a break from work. 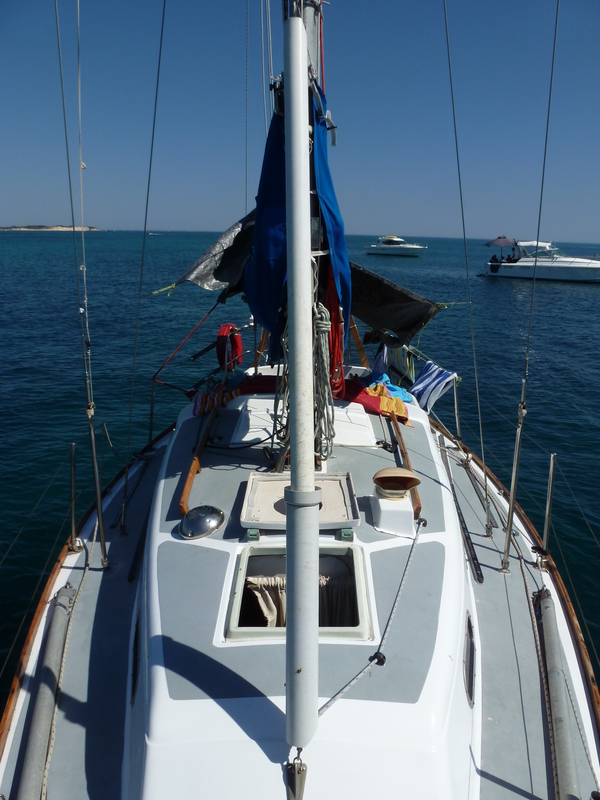 Yesterday we returned home after spending 3 days at sea in our yacht! This is the realisation of a dream for Richard. Ever since he came to Perth and we got married, nearly 20 years ago, he has wanted to buy a cruising yacht and sail the seas. Last September he bought the boat and nearly one year on we finally made it out to the ocean. We have all had to learn to feel comfortable on the boat and that takes time. I had said to Richard in the early days of boat ownership that he will have to be patient with us as we find our feet on deck. He is passionate about sailing and so he is very comfortable in boats and in windy, wild weather. The kids and I are not. So, after months of sailing on the sheltered waters of the river we made it to the sea. To get to the sea we had to travel along the length of the Swan River, go under 3 bridges (with the mast lowered which is no mean feat) and then navigate through the Fremantle harbour, dwarfed by massive cargo ships. While at sea I spent time thinking about the whole notion of stepping out of my comfort zone. It’s a big deal. And everyone has a different definition of their comfort zone. My take on life in the West is that we spend our lives trying to avoid the uncomfortable: airconditioning in the house and car for when it is hot, heating for the cold, stocking up on food for the pantry to avoid hunger, planning things to the nth degree so as to minimize discomfort. Reflecting on my experiences through life (in particular what I’ve learnt in life) is that avoiding those feelings actually hinders us. True experiences of what it really feels like help us develop qualities of perseverance, resilience, empathy and compassion. When I’ve faced up to my fears, pushed through the uncomfortable, I’ve discovered really amazing things about myself, about others and about life in general. And of course it makes life interesting. When I think back to being a young child I was carefree and full of enthusiasm for life. The joy de vie. I did take risks, like walking along the top of the fences between our house and the neighbours in South Africa, knowing that a vicious Doberman pincher lived there! Mooning the passing cars along a busy road. I know, I know, this may surprise some of you reading this that have known me for many years! The times I climbed a big rock and then jumped from it into the ocean (I tried to do this as an adult and failed miserably, unable to get up the rock in the first place and then chickening out as I looked down below and saw rocks beneath the crystal clear waters and wandered what lurked in between them!). I’ve then gone through a rather long stage of life of being afraid to step out of line, to do the wrong thing, to break with tradition and not fulfil other’s expectations of me. Becoming a mother has really forced me to face fears and wrestle with deep emotions. I’ve found this to be painful, but also exhilarating. It’s the thrill of the adrenalin rush. Coming to terms with some deeply held feelings, allowing them to surface and spill over, deal with the craziness of that burst of authenticity and then settle into a state of creative acceptance and moving forward. 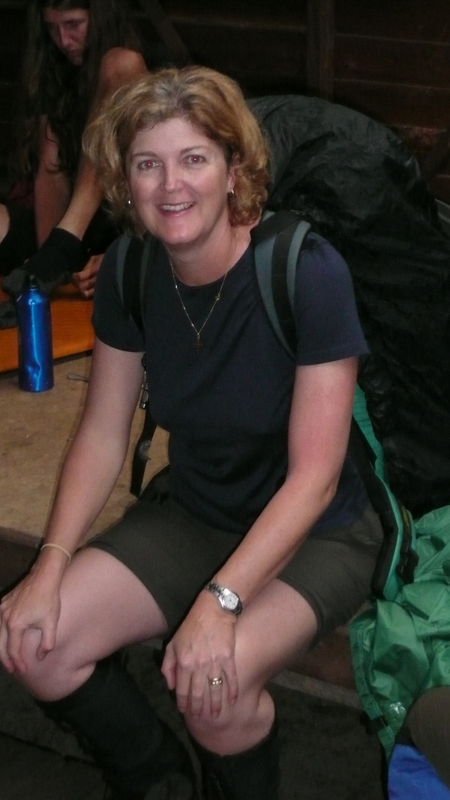 In 2008 I was given an incredible opportunity to hike with my friend Deb and 6 other women. At that stage the only person I knew in the hiking group was Deb. The others I had heard about, but never met. They were all older than me, but definitely fitter than me! I spent 8 days with these amazing women, walking along the Bibbulman Track over the stretch from Walpole to Denmark, the lower South West part of Western Australia. I had left my children in the capable care of their father. This was the first time I had been away from them for more than 2 nights ever since they were born. It was not an easy thing to do and was at times gut wrenching as I prepared for the trip. Many times I nearly pulled out, but I knew I had to do this for me, and again Richard encouraged me as he knew I needed to do this too. I was on a journey to finding myself again after becoming lost in a haze of nappies, breastfeeding and unconditional love. The hike was tough. Up and down sand dunes, watching out for snakes, tending to blistered toes and an uncomfortable pack. BUT, the wildflowers were magnificent, the scenery was incredible – majestic cliffs along a spectacularly blue ocean, and women friends who were like medicine and nurtured my bruised soul. There were tears of pain and there were many tears of joy. I remember driving home from that hike singing songs of praise and thanks to God for bringing these women into my life and for the amazing experience I had just had. My soul was singing again. Just this weekend I thought that that was a significant ‘stepping out’ for me, into my discomfort zone only to be rewarded three fold. 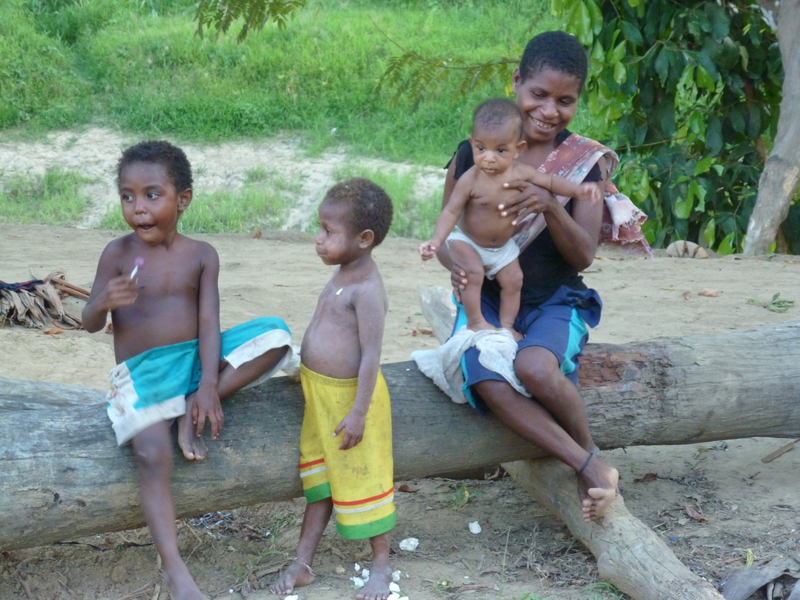 You see when I was asked if I would like to go to Papua New Guinea as a midwife, I was under no illusion that it would be tough, but I knew I could manage because I had been on that hike in 2008. I knew there were surprising rewards awaiting me for stepping out of bounds, bounds that I had created for myself. But, I needed to take the plunge into the cool waters of that experience before it could begin. When Richard kept asking about going on an overnight sailing voyage, I knew I had to face my fears and get ready to step out of comfort again. I thought, well I’ve been hiking on the track, I’ve been to a remote village in PNG, I can cope with being on a small sailing boat with my family for 2 nights! It wasn’t easy. There were some really uncomfortable and unpleasant times like trying to sooth the seasickness in the boys while also feeling a bit queasy myself, being stuck in a small space with 3 other males and not having a shower for 3 days!! But boy were they overshadowed by the wonderful times and experiences. We saw a huge sea turtle sunbaking on the surface of the water, a whale near Carnac Island, several pods of dolphins some which came really close to the boat and caused gasps of delight from my children, beautiful sunsets and moonrises that no camera can capture and of course, snuggling together with my family on the deck while sailing through the ocean rollers feeling safe in our life jackets. The common thread through these 3 significant experiences in my life have been the people. When we step out of our comfort zone for others, the blessings are eternal.